POINTS: It’s the next chapter is the fabulously executed from page to screen Hunger Games series. Anyone who says otherwise is just wrong. 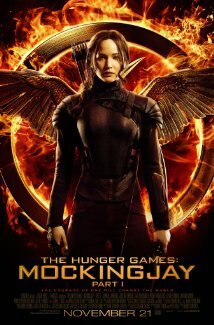 In the very capable hands of director Francis Lawrence, this movie, like its predecessor, rocks. PITFALLS: Hmm… Well… I have to wait a year before part 2 (November 20, 2015). I also have to work before I have time to go see it again. And again. FEMALE CHARACTER(S): Well duh. One of the best heroines every written, Katniss Everdeen, played with all of her star power by Jennifer Lawrence, carries this movie. Along with many other wonderful characters, both male and female, this movie makes for a rocking ensemble of acting, writing, and all-around entertaining goodness. There is no shortage of women in this movie, working side by side with men, and this is very very good. CULTURAL PITFALL(S): I wanted to see more Asian people. However hooray for many African descent characters! HIGH POINT(S): Oh let’s count the ways!! 1.) Jennifer Lawrence. If she is in it, she will deliver a powerful, truthful performance. Not only is she a talented actress, she has star power. She comes off of the screen. Oh and she can sing. Ms. Lawrence: I am so glad you were cast! An Appalachian woman should play an Appalachian girl. 🙂 I can’t wait to watch this woman in any and everything. 2.) Francis Lawrence. What a director! I think that he worked with and listened to author Suzanne Collins in adapting her work. Excellent idea!! Not only is Ms. Collins a wonderful book writer, she has training and practice in writing for film and stage as well. 3.) PTSD, aka Post Traumatic Stress Disorder. Hopefully you are a person who has never or will never experience PTSD. But if you have or know someone who has, then you will see the truth in this movie about PTSD. Katniss has PTSD. She is not going to just recover from it, or act like the events in her past never affected her, WRONG! This is a great story because we see the heroine, and others around her, live with and cope with PTSD – with no mental health support! Her decisions, her actions, her words, and thoughts are all affected by her life’s trauma and that makes this story spectacular. This is also true of Peeta Mellark, beautifully played by Josh Hutcherson. You see, very briefly his glimpses of his madness and trauma. This is realistic portrayal of war. Cope with it people. LION PAW PRINTS: 4 of 5. So Excellent!